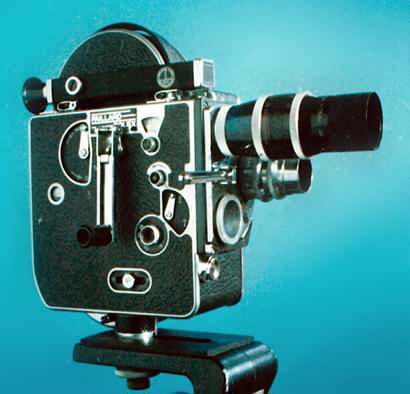 Here are photos of a high-quality BOLEX H16 16mm motion picture camera, made in Switzerland by Paillard Bolex. Serial #136621. This particular camera dates from 1956-58 period and still functions well today. three-lens turret with folding lever accepts C-mount lenses (also called 1-inch-mount lenses)--Switar and others. 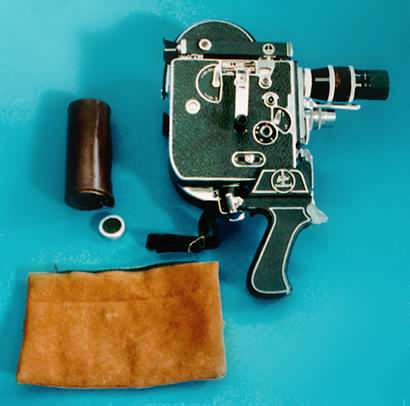 ACCESSORIES IN PHOTOS: take-up reel, trigger grip with its own bag, two lenses, one with both caps, one turret cap, and a leather lens case. Picking up a cheap 16mm camera can be one of the best ways to start experimenting with filmmaking. Whilst video is considerably easier to work with in many ways, and a bit cheaper if you are looking at the lower end of the scale, the fact remains that film is the superior medium. It looks better, it is more accepted at film festivals (although this is changing� slowly) and let's face it, the feeling of seeing your work projected at a decent quality makes a lot of the headaches resulting from shooting film worth while. Another option of course is to give your baby that 'film look' by shooting on film, and getting it telecined to video for an edit. This means you have the nice look, but don't have to deal with the expense of printing film (you can telecine straight from negative to video). You can have all the advantages of editing non-linear, and if your film turns out well you can always go back and match the neg to your video cut and get it printed. Obviously any old 16mm camera you can get your hands on cheap will do. You can pick them up at jumble sales, camera shops, in newspaper classifieds and sometimes from organizations (particularly government departments) that often have a few old ones lying around collecting dust. Regardless of camera, use camera shops as the last resort as prices will often be inflated. So which models are suited to broke wanna-be Spielbergs? 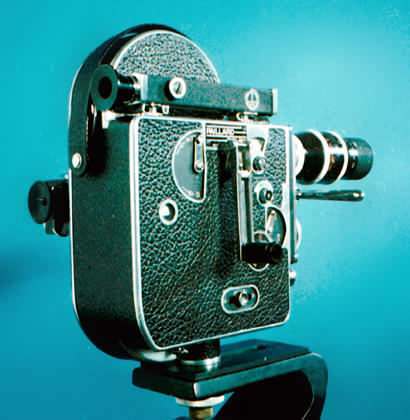 By far the most popular (and one of the easiest/cheapest) items you can pick up is the Bolex H-16. They are versatile and tough, the only downer is they are clockwork. 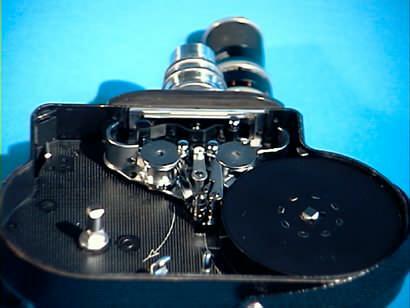 It's pretty easy to disconnect the spring motor and attach an electric instead (and some enterprising filmmakers have even built their own motors). Unfortunately it's not really possible to shoot sync sound with a H-16, but you can always be creative. H-16s come in two varieties: Reflex (Rex) and non-Reflex. The difference relates to how the view finder system works. 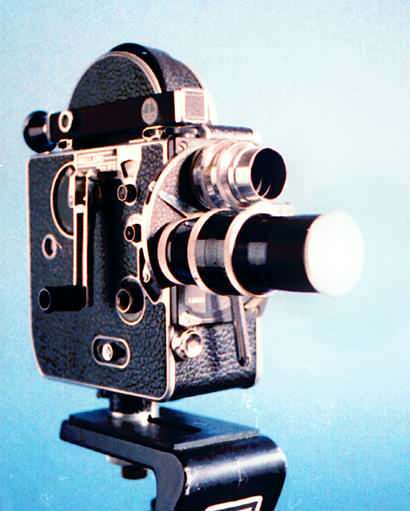 Older H-16s use a parallax view-finder which is mounted on the side of the camera or rotated into position using the lens turret. There will always be a margin or error involved in non-Reflex cameras due to the inability to look through the view-finder during filming. Creativity and practice can minimise this. 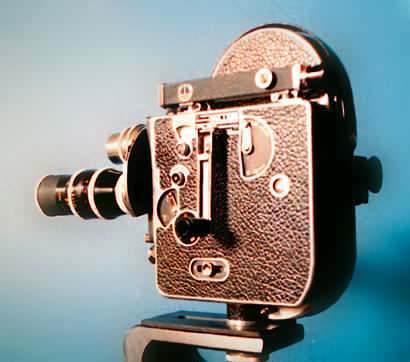 Newer H-16s make use of the Reflex viewing system which uses a prism to split the light entering the lens - most of the light is delivered to the film stock, however a small percentage is redirected to the view-finder. The advantage is you can generally look through the view-finder while filming. The downer is that you have to adjust your exposures to correct for the slight degradation of the light hitting the film surface. Reflex cameras are by far the easier to work with, although you will pay more for one of these. Look for early 'Rexes' (versions 1-3) as newer models will probably set you back at least $US 2000. Non-reflex cameras range from about $US 200 upwards. 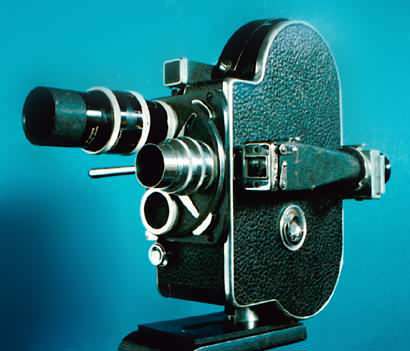 There is an excellent website covering the history/features of the H16 at http://www.city-net.com/~fodder/bolex/. All content c. 2001 by R. D. Nelson unless otherwise indicated. All rights reserved.